When planning your workspace don't forget to leave plenty of room for a chair to swivel/move. Don't forget power sockets, telecoms and fire exits etc. Sonix is rich with style and durability. The Sonix range has extra features that the Influx and Trexus don’t. These products are right at the top of the mid market. Sonix is a higher spec product than the Trexus or Influx. You have all the style and features of the other products along with seating that is designed for strength and durability. Range goes from 114kg / 18 stone to 150kg / 23 stone. All offering moulded foam for maximum support. More specialised fabrics available to give enhanced fire retardancy. Some of the range is suitable for use in more heavy duty environments. This is a very design focused brand. Sonix offers a new colour for this year, a rich Walnut. A lot of care is taken when designing this range. You will find organic shaped desks in Sonix Boom range that will allow you to produce an interesting and stylish workspace. Sonix Cantilever, Style, Matix & Classic all have styling differences with the leg shapes. 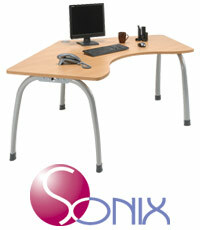 Desks are available in Radial, Wave and Rectangular shapes. Styled wire management ports and stylish wire management systems can be found in this range. The pedistals have 14-gauge steel draw runs. The pedestals also have folding keys. All desking has a 2mm edging. This is a stunning range that is fully accessorised.